'Doctor Who': Are you a Ganger? ‘Doctor Who’: Are you a Ganger? Posted May 27, 2011 by William Martin & filed under Win. To celebrate Doctor Who‘s current two-part story, ‘The Rebel Flesh’ and ‘The Almost People’, we’re looking for our own Doctor Who Gangers! Are you a doppelganger for a Doctor Who character? If you reckon you look a bit like anyone from the Doctor Who universe, past or present (or future), send your photo over to gangers@cultbox.co.uk (and don’t forget to tell you who you reckon you look like). Our two favourite entries will each win an official Doctor Who action figure from Character Options! This competition has now closed. 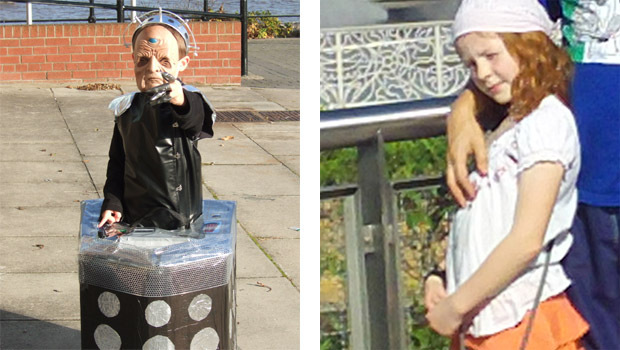 The winners are Charlie Nelson as Davros and Charlotte Chester as young Amy Pond, congratulations!